To T or not to T? It’s a tough question. Testosterone is a powerful hormone that can radically alter your body and your internal landscape. For many trans guys and some nonbinary people, testosterone is a ticket to a new world in which body, mind, spirit, and social perception finally align. But how can you know in advance whether that new world is really right for you? And what if the ticket is one-way? I have been on testosterone for 4 years, and I’ll probably continue for the rest of my life. I spent several years desperately agonizing about whether to take T, and today I can say it was one of the best decisions I have ever made. Here is the advice I wish someone had given me back when I was wrestling with this question. 1. Do your research. In my experience, trans people turn into veritable internet librarians when it comes to our transitions. If you’re reading this post, chances are you’ve read dozens of articles on the physical effects of testosterone, plus sought out hundreds of blogs, videos and photo timelines documenting others’ experiences on T. But if you haven’t done all that yet, do it. 2. Talk to a doctor. A lot of people–including me–make talking to a doctor the last step of this quest. In retrospect, talking to my doctor early on would have greatly simplified the whole process. Ask whether it would be safe for you to take T based on your other medical conditions, what the process would be to get a prescription, and whether you’ll need any referrals. This gives you a timeline and clear series of steps if/when you decide to move forward with testosterone. If your country uses a structured clinic system, find out what is required to qualify for treatment and how long it takes to access hormones. This info will clear up a lot of the stressful questions that make this process such a challenge, such as, Will I be able to get a prescription? What tests will I need? How long will it take? How much will it cost? Do I need a new doctor? With that out of the way, you can focus on figuring out what you want and need. 3. What will you regret? Suppose you start testosterone tomorrow. Imagine yourself in 10 years. What might that person regret? Now, suppose you never take testosterone. Again, 10 years down the line, what might you regret? Nobody knows the future, but I found this a very helpful exercise. I realized that my greatest fear was never taking this opportunity, looking back and wishing I’d started T as a young guy. On the other hand, I couldn’t muster any real fear about, say, being perceived as a boring straight guy or not trying harder to live as a butch. (I tried as hard as I could.) Look into your heart; there may be helpful answers waiting there for you. 4. Do you want the whole package? Testosterone is a gamble. Each person responds differently based on dosage, genetics, length of treatment, and possibly magic. Think carefully about the effects of T, and ask yourself whether you are open to the whole range of possibilities or really only want some of the outcomes. The changes can happen to varying degrees and in different combinations. You might go in imagining yourself with a deep voice, toned muscles, and smooth skin, and wind up a chubby tenor covered in hair from head to toe–or vise versa. A lower dose will cause subtler and slower shifts, maybe no visible changes at all. But basically there are no guarantees, except that you’ll generally move towards more male-typical traits. Are you looking for the whole experience, external and internal? Or are there just a few specific changes that you want? If, for example, you want a more masculine physique and voice, and are wary of any other changes, you might want to experiment with diet, exercise and voice coaching before you try hormone therapy. 5. Seek guidance from a higher power. With a decision this big, it’s a good idea to turn to whatever sources of wisdom you find meaningful. Does your culture have traditions for gaining insight, beginning a journey or making a hard decision? Do you find meaning in prayer or meditation? Some places you might turn include scripture, religious leaders, faith healers, wise friends or family members, mentors and mental health professionals. This could take many forms depending on your beliefs and culture. A few ideas to get you thinking: get your Tarot cards read, set aside a day to meditate on the question, ask God for help, ask for the answer to come in a dream, create visual art exploring your feelings, go hiking or camping alone. The point is, you probably need to get outside of your mind to find a real answer. Find a way to access higher wisdom or deeper insight that works for you. Whatever resources you have, call on them now. 6. Whatever you do, do it for you. You’re probably facing opinions and pressure everywhere you look. Transitioning is taboo, so you’re probably feeling some pressure not to modify your body, to make it work in your assigned gender (possibly for the sake of feminism, the children, or something), and/or not to do something “artificial” or “unnatural.” On the flip-side, there’s also a strong norm that if you’re going to transition, you better transition to be a normative man or woman, including hormones and surgery. So you’re probably also feeling some pressure to follow a certain path through transition, including a dose of testosterone that will put you in the typical male range. It’s almost impossible to think clearly in this hurricane of social sanction. But, as much as you’re able, try to sort out your own needs and preferences, and make your choices from a place of self-love. Whether you decide to take testosterone or not, do it for you. 7. Go for it. At some point, you have to take a leap of faith and go with your best guess. You may find that you’ve taken plenty of time to think, done thorough research, and reflected deeply on the question, and you’re still not sure what you want. Make an educated guess and move forward, knowing you can change course if needed. If you’ve spent a year or five reflecting and you just can’t stop thinking about testosterone, you’re probably going to have to try it yourself to be satisfied. Let your fears slow you down and make you careful. But don’t let your fears paralyze or stifle you. It’s okay to venture into the unknown. In fact, it’s wonderful. 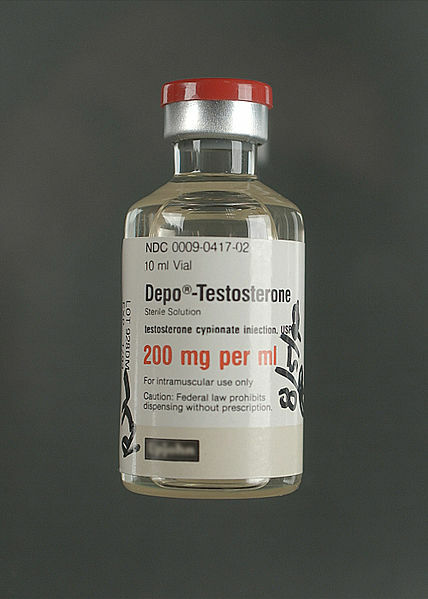 What questions do you have about testosterone therapy? For those who have been on T, how did you make your decision? What do you know now that you wish you had known then? This is a very well-timed post for me to read. Thank you! I didn’t really agonize over T that much. I was feeling really depressed at the time and had read an article about the positive effects of a low dose of T on women who are post menopausal (me) and used that as my excuse to start a low dose and put my proverbially toe in the T pool. I didn’t fret over the side effects because I was only going on a low dose and didn’t think that there would be any changes that I would either not be able to reverse if I desired or couldn’t live with down the line if I decided to quit using it. The result is that I felt so so so much better mentally (almost immediately!!) from using it that it really didn’t matter to me what changes it created. I now feel the most like ME since puberty started (gasp!! 39 years ago!!!) and estrogen took over my body. The only thing I’m not so cool with is losing the hair on my head. So far so good but it is receding gradually. Otherwise, I’m happy with what it’s doing. I hope this helps some folks. My understanding of Rogaine, after looking into it, is that it really only works on the pesky bald spots that we get on the back of our head, not the receding hairline problem. What works for receding hairlines is a drug called finasteride (Proscar and Propecia), however it also blocks T as it is an anti-androgen, so it’s not helpful if you’re trying to masculinize. I think the finasteride could be helpful at a later time (say, year 2 or 3 of T) once most of the effects of T have come in. This is just what little I know of the subject and if anyone else has more to add I’m all ears. Thanks. I did all of these things. However for me I added looking back over the past 48 years as well. Looking at how frequently the desire to transition arose and I pulled away in fear. An then looking at now and asking do I want to continue doing this – letting fear override my truth – for another decade or the rest of my life as it felt like I was on the precipice of its now or never. Great post! For me, it came down to should I continue to obsess, or should I take action and see what happens from there? I needed to move forward, and keeping in mind that I had time to figure it out from there helped – changes weren’t going to happen over night or even over the course of months and months (considering the low dose that I’m on). Like you, it was one of the best decisions I have ever made. Thanks for this post. Incredibly timely and helpful. I’m so inspired by those who choose what’s best for them, define ‘transition’ according to their own desires, and go forward, despite the myriad of pressures to conform to certain ways of being a body. I’m getting closer and closer to finding my own ‘transitional’ path as a non-binary person and cultivating the courage to construct a more liveable body/life. Thanks for this post, I found it very interesting and thought-provoking as I’m asking myself whether or not I want to take Testosterone. I find that a lot of my decisions seem to be based on trying to convince others around me that I am “trans-enough”. I think this is something that’s in my own head, and I like the suggestion of voice training, I’m going to look into it!